The City of Hillsboro has planned ahead to identify an additional safe and reliable source of water for the City’s future. The Tualatin watershed will continue to be Hillsboro’s primary water source, but in the next 25-50 years the City anticipated the need for twice the amount of water currently available from the Tualatin. How did the City of Hillsboro arrive at this decision? 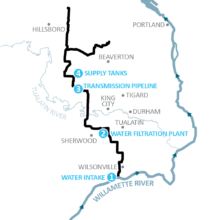 Multiple sources were evaluated: mid-Willamette River, groundwater, raising Scoggins dam to increase the capacity of Hagg Lake, and purchasing wholesale water from Portland. Savings achievable through water conservation were also evaluated to determine if more conservation could delay the need for a new supply. The Utilities Commission measured each potential source option against the set of 10 criteria that was selected by them after receiving input from their staff and customers. 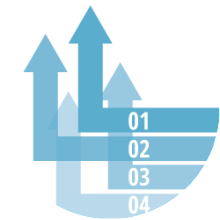 The Mid-Willamette option was selected because it was the least expensive option, had the most positives and was the only option that successfully met all of the criteria. 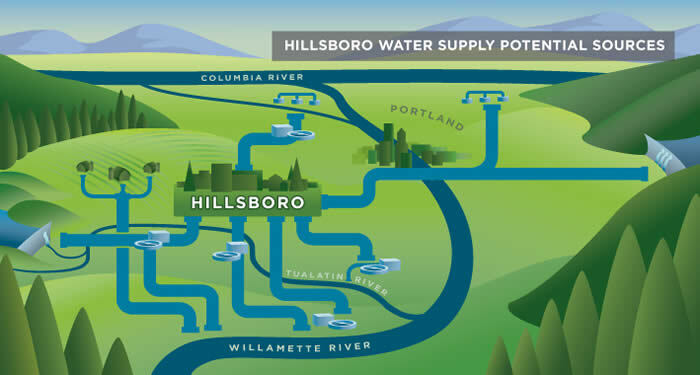 Hillsboro is a regional leader in the protection, treatment and delivery of high quality water to our customers in Hillsboro and western Washington County. Learn more www.hillsboro-oregon.gov.